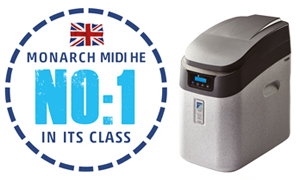 Fig 1 shows the water softener in the normal Service position i.e. 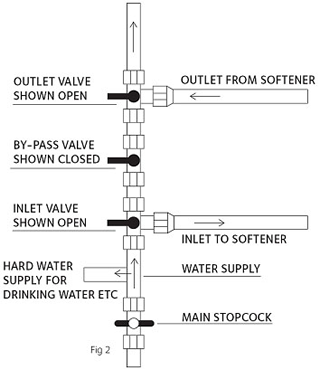 Inlet Valve: This valve is Open when the blue handle is parallel to the sides of the isolating valve that has the hose connected to it. Outlet Valve: This valve is Open when the blue handle is parallel to the sides of the isolating valve that has the hose connected to it. Bypass Valve: This valve is Closed when either a Black handle or Screwdriver slot is at 90degrees to the isolating valve connected in the copper pipe work. The layouts are exactly the same as the above. The Inlet, Outlet and Bypass valves will have either screwdriver slots (early versions) or lever action for easier use. Inlet Valve: Turn blue handle 90 degrees so it closes the flow of water through this valve. Outlet Valve: Turn blue handle 90 degrees so it closes the flow of water through this valve also. Bypass Valve: Turn Black handle or Screwdriver slot 90 degrees so that it is now parallel to the sides of the isolating valve, this will then open this valve and allow water through to your system. Simply turn either the screwdriver slot or the lever on the Inlet, Outlet and Bypass valves 90 degrees. This effectively closes the flow of water through the Inlet and Outlet valves and opens the Bypass valve for water through to your system. NORMAL SERVICE POSITION – all handles face the same way. 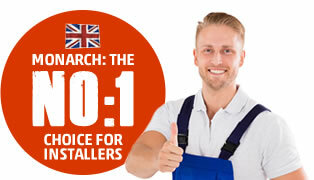 Fig 2 shows the water softener in the normal Service position i.e. 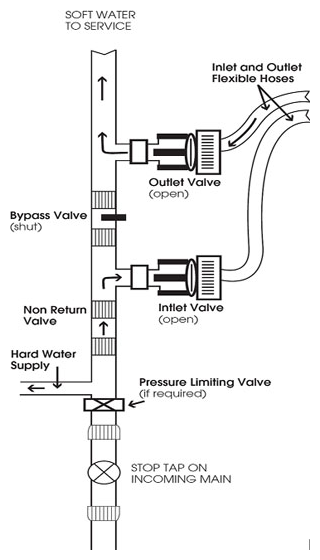 Inlet Valve: This valve is Open when the blue handle is 90 degrees to the sides of the isolating valve that has the hose connected to it i.e. it ‘points’ to the hose connection. Outlet Valve: This valve is Open when the blue handle is 90 degrees to the sides of the isolating valve that has the hose connected to it i.e. it ‘points’ to the hose connection. BYPASSING YOUR WATER SOFTENER – all handles have effectively been turned 90 degrees. Inlet Valve: Turn blue handle 90 degrees so it closes the flow of water through this valve so handle is now parallel to plastic nut on the hose connection. Outlet Valve: Turn blue handle 90 degrees so it closes the flow of water through this valve so handle is now parallel to plastic nut on the hose connection.